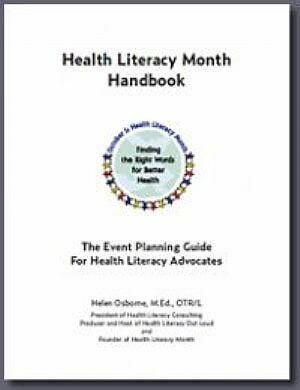 Health Literacy Month Handbook is a guide to help you create, plan, run, and evaluate Health Literacy Month events. It is intended as a reference to use throughout your planning process. Topics range from brainstorming ideas and finding people to work with to putting an event together, marketing it, and assessing its effectiveness. It includes examples of events other people have conducted along with their insights and observations about why they made it happen and what the event accomplished. The Health Literacy Month Handbook also includes worksheets, a sample press release, countdown calendar, and other practical tools. Appendices: A) Countdown to Health Literacy Month: A List of Things to Do Including When to Do Them, B) Sample Press Release, C) Notes to Me: Assessing the Success of My Health Literacy Month Event.